The Best ER Program in the World? A couple of months ago I finally had the chance to visit SEG in Tokyo. This is Akio Furukawa’s school, and one of the biggest ER programs in the world. I wrote an article about my observations and thoughts for the Extensive Reading SIG newsletter. I had wanted to visit SEG for years, so I was delighted when the opportunity to do so came up in March 2014. I am very grateful to Akio Furukawa for inviting me, and to all the teachers and students who welcomed me so warmly into their classes. 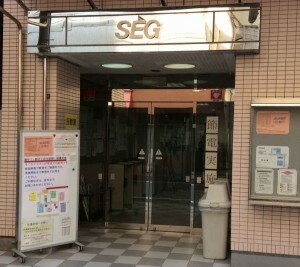 SEG (Scientific Education Group) is a juku located in the heart of Shinjuku in Tokyo. It is a successful business, serving around 3,000 students a year and helping many of them toward academic success. SEG was founded in 1980 teaching mathematics and science, but in 2000 started offering extensive reading classes. These were changed in 2006 into the current format of classes split between ER and oral communication. For extensive reading practitioners, SEG is important because of the activities of its founder, Akio Furukawa. Originally a mathematician, Mr Furukawa is perhaps best known for the YL (yomiyasusa level) readability scale and the extensive lists of word counts he publishes in the English ER Complete Book Guide, currently in its 4th edition, available online at SEG. Mr Furukawa has also been very active in promoting ER in Japan through his activities with the SSS (Start with Simple Stories) movement, JERA (the Japan Extensive Reading Association), and his numerous publications on ER. SEG is just a few minutes’ walk from Shinjuku station, just off the main street. The first hint that you might be drawing near is the various staff members wearing blue SEG armbands as they keep an eye on the students walking to and from the school. The school is actually spread out among a number of different buildings in its neighbourhood, each holding several floors’ worth of classrooms. The English classrooms are essentially mini-libraries, with each one holding around 20,000 books. The desks are standard Japanese school issue, with twenty to thirty per room. Glancing at the shelves reveals an eclectic mix of graded readers, levelled readers, picture books, children’s books, young adult, and regular fiction and non-fiction. There are two types of classrooms: one for beginners consisting mainly of Oxford Reading Tree, picture books, and easier graded and levelled readers, and one for more advanced students with higher level books and novels. I saw several of my own favourite books at the school, including the Dune series, Heinlein’s Citizen of the Galaxy, the Millenium trilogy, Nick Sharratt’s Pants books, and pretty much all of the books I use with my students. I also managed to read a couple of new ones that I really enjoyed: The Giver by Louis Lowry and The Report Card by Andrew Clements. I was supposed to be observing the class, but the books proved too tempting. To be honest, I could have spent months there reading. The second thing I noticed was how focused the students were: They all had books to read, or listen to on personal CD players, and were quietly getting on with things. Between books they would fill in their reading records and consult with the teacher. SEG’s English curriculum is divided into two strands: extensive reading classes taught by Japanese teachers and communication classes taught by native speakers. The ER classes are conducted in Japanese and the communication classes are conducted in English. Classes contain up to about 15 students and are led by one teacher, occasionally assisted by trainee teachers. The communication classes start out as speaking and listening for junior high school first-year students, and add intensive reading and writing later on. These classes use textbooks and are held in the English classroom-libraries described above. In the current SEG system, students stay in the same classroom for both ER and communication classes while their teachers switch halfway. Both classes run for 80 minutes in a three-hour block with a 20-minute break in the middle. During the extensive reading classes, students mainly read silently. There are supplementary activities such as listening, shadowing, and speed reading, but for much of the class there is a quiet hum of concentration. Each student reads at their own level, and can choose whether to read, listen, or listen while following along in their book. Most of the books I saw for lower-level students had CDs to accompany the text. SEG teaches a purist approach to ER: students read without dictionaries and stop reading if they find books difficult or uninteresting. There are no tests or book reports to write: instead students make a record of the book title and write a short comment about it. Students record their reading in special notebooks, and many of the students I saw had incredible cumulative word counts, including one high school girl who was approaching 4 million words! Students were reading a range of books, from Oxford Reading Tree to compendiums of famous murder cases. It was not actually until the morning of the second day that I realized the significance of what I was seeing in the SEG extensive reading classes. I had been distracted by the amazing libraries, the orderliness, and the student achievement. The real point of interest, however, is the teaching method. It does not say much for me that I had read about SEG, talked to teachers at SEG, and observed half a dozen classes, and still had not realized what was going on. At SEG, students do not choose books. Instead the teachers, based on their knowledge of the students’ level, their interests, and the books, suggest books that they think are appropriate for the students to read next. This method is similar to what Donalyn Miller describes in her book The Book Whisperer. An experienced teacher can make better recommendations than students can choose for themselves, because they have actually read all the books and know which books have appealed to which students in the past. A skilled teacher can push students to read a little more, to read something a bit more difficult, or to take a break and read something easy if they are tired or low on energy. Seeing this in action is impressive. Teachers flit around the classroom chatting with students as they finish reading, grabbing specific titles from the shelves in passing and dropping them in front of students. Occasionally the teacher will look at a student’s comments in their reading record, or pause to write something in their own notes. I talked to a couple of the teachers about this central aspect of their classes, and they confirmed that it was not as effortless as it looked. Teachers keep detailed records of what each student has read, including notes on whether they liked it, found it difficult, or gave up. They spend time before class mentally preparing and lining up possible books. One teacher I spoke to spends most of her 90-minute commute thinking about and making notes about which books to recommend to each student. The students are not passive in this process, but are involved in a constant dialogue with their teachers, both through their reading notebooks and also by talking about each book as they finish it. Students are free to stop reading books if they find them boring or difficult, and often make requests or suggestions. One student in a class I observed asked his teacher for a book featuring water polo, a request that had both of us stumped! Teachers at SEG try to balance graded and non-graded material to maximise the benefit to students. While graded readers are often a better fit in terms of accessible language, levelled or native materials tend to be more attractive and interesting. A judicious mix of books allows students to get the best of both worlds. The other key ingredient in the ER program is in-class reading (sustained silent reading), which means that the students do at least 70-80 minutes of reading in English a week. Many students also take books home with them, and of course starting them in class makes it much more likely that they will finish them as homework. Mr Furukawa told me that roughly a third of his students attain high proficiency in English (as measured by independent test scores). As a point of reference, I would say that maybe 10% of mine go on to master English and make it a part of who they are. My visit to SEG blew me away. The size and success of the school, the richness of the resources, the achievement of the students, and the skill and knowledge of the teachers changed my view of what is possible. I don’t think I will be able to adopt guided extensive reading in my university classes. With over 40 students per class, I just won’t be able to give each student enough attention, but I can certainly try to increase the number of interactions I have with students. I have resolved to contribute more to students’ reading choices by recommending books and giving advice. Mr Furukawa and SEG welcome visits from teachers, and I recommend that any teacher interested in extensive reading or English teaching consider giving them a visit. Fascinating article Ben. It may be difficult for a small school or private teacher to replicate what they are doing at SEG, but I guess the first thing to do for typical once-a-week class scenario would be to add an extra class. The extra class would be for Extensive reading and listening and perhaps some writing guided by the teacher, but basically self study. Mixed level classes wouldn’t be a problem, and could be actually be preferable. The first problem is getting enough books, but with a combination of paper books and digital materials becoming cheaper it could be do-able. We’re starting a trial class on Sundays from October (90 minutes a week, 2000 yen a month, first ten students only) to figure out systems. As you said, mixed levels don’t matter. We’ve been accumulating books for years now, so probably have enough for now. I am spending all my free time at the school labeling our books (2000 down, about 5000 left to go). From April, we’re planning to split JHS and SHS students off into a separate school we’ll call Cambridge Academy to differentiate it from Cambridge English. I see a lot of potential in this Academy, once we get the systems working smoothly. Cambridge Academy opened on April 1st, and so far I love it. The curriculum and facilities are nowhere near finished, but even so the first wave of students did really well and seemed to enjoy their class. Hope to have a fuller report soon.